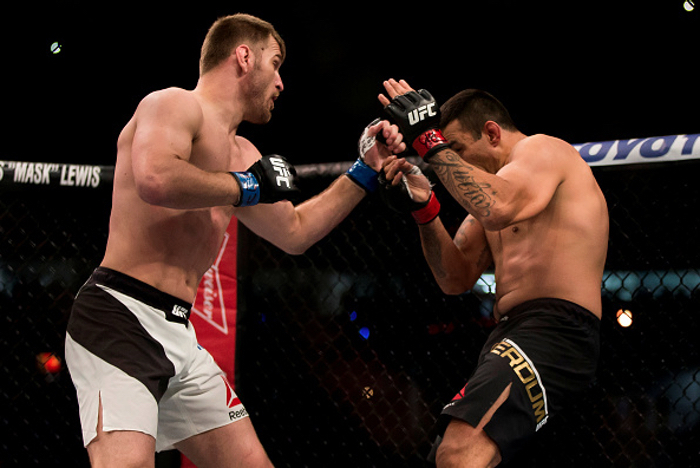 A right hand from Stipe Miocic brought a stunning end to UFC 198. As he connected on Fabricio Werdum, the American brought the passionate Brazilian fans in the Arena da Baixada to silence, having fully expected success from their countryman. 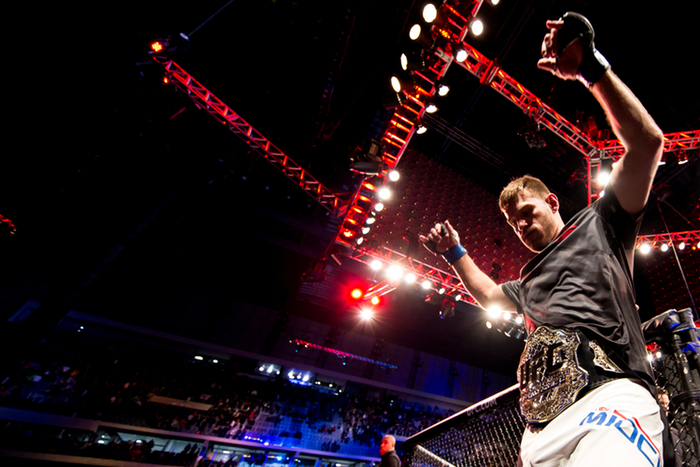 Wedrum opened up in the exchanges very confidently when he looked to claim his first title defense against Miocic. The Brazilian jiu jitsu expert kicked the legs and body of Miocic, but after a while the champion seemed to lose his composure. Chasing his challenger across the ring, Miocic clipped Werdum and sent him hurtling to the canvas. To celebrate, Miocic ran into his corner to celebrate and even seemed surprised himself as he screamed, "I'm the champ of the world!" to his emotional corner team. Ronaldo 'Jacare' Souza managed to take Vitor Belfort down into his realm on the ground after two failed takedown attempts on 'The Phenom' after two minutes of the co-main event. He opened up the former UFC champion with some elbows from top position, and after the doctors checked the cut, Belfort managed to explode to his feet. 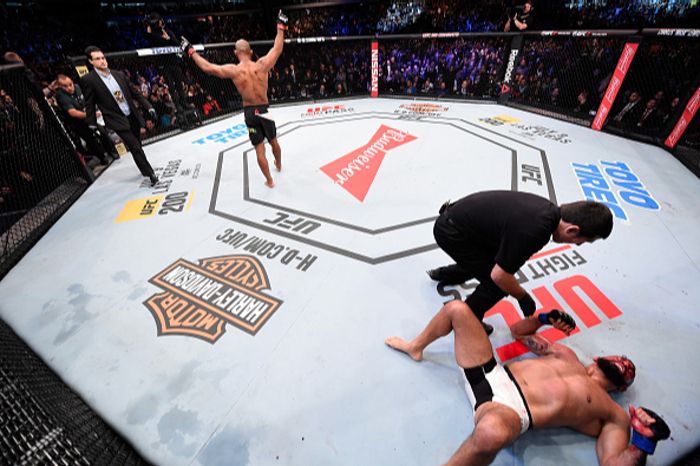 Vitor found himself on the ground again shortly after and Jacare landed heavy strikes from the mount position, forcing the referee to step in with just over twenty seconds left on the clock. Following the victory, Souza asked to meet the winner of Luke Rockhold versus Chris Weidman for the UFC middleweight title. Having picked up a loss to Rockhold earlier in his career, Souza promised to finish him should they meet again, in his post-fight interview. Lesley Smith's belief that her sparring with Cris Cyborg had given her enough knowledge to challenge the Brazilian proved to be wrong when they met on the main card. The Brazilian Invicta featherweight champion took a TKO victory in just over a minute in front of her hometown crowd and looked as devastating as ever in doing so. 'Cyborg' followed up a kick to the body with a left-right combination that sent Smith down around the minute mark. Despite the durable American's attempts to keep moving on the ground, Justino did enough damage to force the referee to step in. Interestingly, the polarizing champ claimed that she still wanted to defend her Invicta title and fight "catchweight" contests for UFC after her bout, through a translator. With no mention of a further move down to bantamweight, a much-anticipated bout with Ronda Rousey still hangs in the balance. 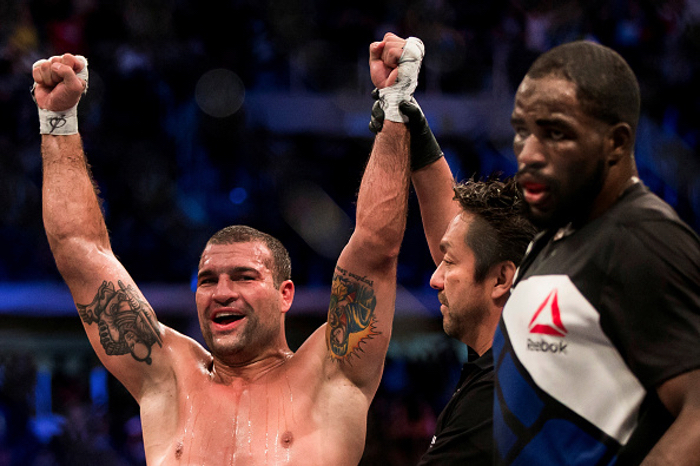 Mauricio 'Shogun' Rua's big stopping power punctuated the ends of the first and second round, which proved enough to win a split decision over Corey Anderson. 'Shogun' dropped Corey Anderson at the end of a competitive first round with a stunning left right combo. The Brazilian tried to unload on the grounded Anderson, but the American did well to cover up until the round was brought to an end. Two massive takedowns got Anderson back in the fray in the second, even though Rua took mere seconds to get back to his feet. Yet, just when it seemed Anderson had done enough to win the round, 'Shogun' clobbered him again and sent him down in the final seconds. Anderson stuck to 'Shogun' in the dying round to the audible disappointment of his hometown crowd. Bryan 'Bam Bam' Barberena became the first non-Brazilian to win at UFC 198 after braving the early surge of Warlley Alves to claim a unanimous decision. An early guillotine attempt and a number of heavy shots from Alves left him visibly tired by the time the second round started. Barberena came back and had a spell of success towards the end of the opening five minutes as he began to chip away at Alves' left leg. Alves came out like a bull in the second again, but his dominance did not have the same longevity as it did in the first. 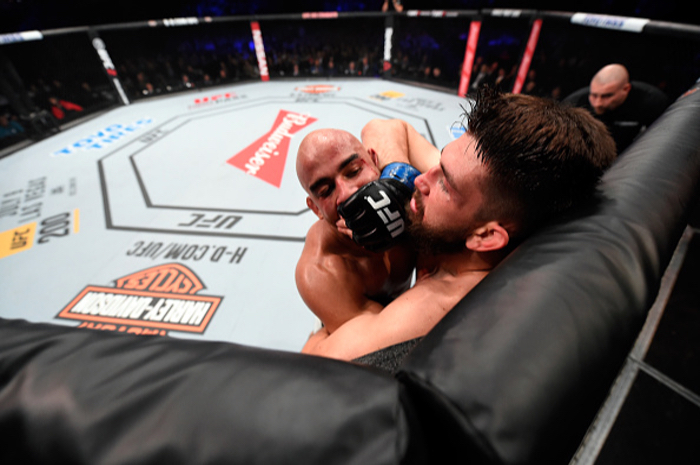 The longer the round wore on, Barberena's combinations and kicks to the body of Alves started to have the desired effect. In the third round, Barberena channeled his inner Diaz and his pitter-patter boxing completely stifled the attacks of his Brazilian counterpart. Demian Maia underlined his status as one of the greatest jiu jitsu players to ever enter the Octagon with his third round submission win over Matt Brown. Just over a minute into their clash, Brown found himself in the worst position imaginable, with Maia on his back. Despite constant choke attempts and shots from the back, 'The Immortal' managed to keep his composure, despite getting hit twice by fans on his way to the Octagon. Brown was on his back thirty seconds into the next round too, and ten seconds later Maia had already secured his back and a body triangle, where he remained for until the final seconds of the round. Stuffing four Maia takedowns in the first minute of the third, Brown looked dejected when he ended up on his backside again. With thirty seconds left on the clock, Brown eventually succumbed to a rear-naked choke from the three-time BJJ World Cup winner. Nate Marquardt did his best to put pressure on Leonardo Santos in their middleweight bout, but a left hand sent him reeling on the exit from a clinch with two minutes still left on the clock. Despite a valiant effort to stay in the fray, a big left hand from Santos sent the former middleweight contender to the deck and the fight was called shortly after. Yancy Medeiros had to weather a damaging storm from Francisco Trinaldo in the first round of their clash, which was deemed a unanimous decision victory for 'Massaranduba' after three rounds. Despite spending the majority of the five minutes in the clinch, the Brazilian smashed Medeiros with an overhand right in the final moments that sent him into survival mode right up until the bell that coincided with a flush knee from the clinch. Medeiros' struggle continued for the majority of the second until he cracked Trinaldo with a firm right hand that sent him to the ground with ten seconds on the clock. Just when he looked like he was coming into his own Medeiros got caught with a combination of hard hooks, which sent him wobbling throughout the final Trinaldo onslaught. John Lineker's brutal body assault on Rob Font in the first round of their preliminary bout wasn't enough to bring it to close. Throughout the second round, Lineker battered the legs of Font and towards the end of the round, he began to headhunt. Font stayed in the bout until the third but remained a passenger. Linear urged his opponent on to him in the final seconds of the bout and cracked him on the way in with a left hand. He followed up the finish until the final bell with his grounded assault, but Lineker had to settle for a unanimous decision to make 2-0 as a UFC bantamweight. Antonio Rogerio Nogueira brought the first big roar of the night out of the Curitiba crowd with his first round TKO finish of wrestling standout Patrick Cummins. Cummins failed to take the Brazilian legend to the ground on two occasions, and with the fight kept on the feet, Nogueira picked him apart with his boxing. In the last minute of the round, Nogueira clipped Cummins with a right hand that visibly stunned him. Following it up with solid left hands, Nogueira finished the fight as Cummins held on to a single leg with solid grounded strikes. Brazilian jiu-jitsu champion Sergio Moraes took a draw from his contest with young up and comer Luan Chagas despite being dropped by a head kick in the first round of a bout that took place earlier in the night. Renato Moicano edged out Zubaira Tukhugov by a split decision in the curtain raiser of the event.